PDF: -- 384K -- Provides the document in Portable Document Format. HTML: -- 488K -- Displays the document as a web page. articleEnFa.pdf: -- 384K -- . presentationEnFa.pdf: -- 100K -- . emailContentEnFa.pdf: -- 368K -- . The Libre-Halaal ByStar Digital Ecosystem is presented as a unified and non-proprietary model for autonomous internet services and a moral alternative to the Proprietary American Digital Ecosystem. Today, the world is largely unaware of this. The public is completely oblivious to the perils of the proprietary Internet model, and happily entrusts its personal data, its privacy, its freedoms and its civil liberties to proprietary business interests. And the people whose responsibility it is to safeguard the public interest – government, and the engineering profession – are asleep at the wheel. Or worse yet, they have become accomplices. This is about rescuing humanity from the dragnet of Google, Facebook and America’s surveillance economy. Our primary offerings are real, tangible and practical autonomy and privacy – on very large scale. The totality of Libre-Halaal software, Libre-Halaal Internet services, content generation and publication facilities and societal frameworks that we describe are designed for preservation of ByStar user’s autonomy, privacy and freedom. The health of society is our objective. This is not about rejection or prohibition or censorship of Internet. This is about creation of a parallel digital ecosystem within the Internet based on values which are very different from the economically driven proprietary American digital ecosystem. By “Digital Ecosystem”, we mean the whole thing, including inter-related software, systems, services, content and societal frameworks. The integrated facilities of ByStar are intended to be used by a very large segment of population on this planet. The scope of these integrated offerings is vast – paralleling most of what exists in the proprietary Internet today. A functional equivalent of Gmail that recognizes your mailbox must be autonomous and private. A functional equivalent of Facebook that respects your privacy. A functional equivalent of YouTube that recognizes your content as yours. A functional equivalent of Windows that creates a deep Software-Service continuum. In the ByStar model these capabilities are unified, consistent and coherent. This is not about any new particular functionality. It is not a faster, cheaper, better story. In terms of functionality, what we offer is generally same as what exists today. Our model provides for the existing functionalities, while offering tangible autonomy and tangible privacy. There is nothing anti-business about our offerings and our moral stands. The ByStar business model is simply different from the current dominant American business models of exploiting privacy and autonomy. We are in the business of providing autonomy and privacy. And there is plenty of money in that. Broad and deep usage of our software and our Internet application services will create revenue opportunities that are similar to those of large Internet application service providers today. These revenues include subscriber fees, advertising, customization consultation, general consultation and interaction facilitation fees. Profit, business and economics are an integral part of ByStar. They are rooted in the correct manner-of-existence of software and services. The entirety of ByStar software and services are internally transparent. ByStar software and services development process is fully collaborative. Based on the nature of poly-existentials, ByStar ideology fully rejects the Western Intellectual Proprietary Rights regime. We believe that privacy, autonomy and freedom aspects of the Digital Ecosystem that we are creating are important enough to “convert” many existing proprietary service users to become Libre-Halaal ByStar users. All attempts at claiming autonomy and privacy in the proprietary model are hollow at most. It is not possible to offer real and tangible autonomy and privacy without committing to complete internal transparency of software and services. The proprietary model leads to dark software and dark services (internally opaque) which are inherently anti-autonomy and anti-privacy. The demand for autonomy and privacy are very real. Many are starting to recognize that things like Facebook are very wrong. Healthy alternatives are craved. Humans are more than just economic creatures. Internet’s model can not be based on pure economics. The Western Intellectual Property Rights (IPR) regime is a colossal mistake – Western IPR laws are in conflict with nature and detrimental to civilization. If you are unable or unwilling to explore the truth behind these basic concepts, then ByStar is likely not for you. If you recognize the critical distinction between humans and economic creatures, and if you recognize the basic human need for autonomy and privacy, and if you are willing to explore the rejection of the Western IPR regime, then the Libre-Halaal ByStar Digital Ecosystem could well be for you. Various attempts at blowing the whistle are made by some, but these are often crude and lack understanding of root of the problem. We need to re-decentralise the Web. It’s important to have the geek community as a whole think about its responsibility and what it can do. Many Americans work for the likes of Facebook, Google, Microsoft, Yahoo, etc. Or they are related and dependent on these companies. If bread and butter of these companies was to become profiting from crushing autonomy and privacy of the individual, most of their employees would likely not have any interest in facing an honest mirror. That has already happened. People are naturally good at justifying the morality of their self-interest in a variety of forms. Mass psychology then kicks in and reinforces short term interests towards global mass exploitation. It is an inherent characteristic of citizens of unchecked powers to confuse morality with self-interest. Consider America and Americans. From the perspective of a drug dealer, use of drugs is no problem. Many drug pushers are drug users. They want every body to be using drugs. After all, it is a profitable business and economics is the basis of everything. When someone tells them that subjecting cocaine to business and economics is wrong, the drug dealer does not have the ear for it. This sort of thing happens gradually. People become accustomed to the problem. They become dependent on the problem. They become the problem. The next generation is born into it. And then there is no problem. The concept that these very same awesome capabilities and technology can exist in a healthy context is foreign to the public at large. Industrial tools is all that they have seen, Tools for Conviviality, , is Greek to them. There have been various engineering efforts to address these problems. Because these efforts are mostly just engineering centric, at best, they have proven to be limited in scope and at most peripheral. Most of these efforts are Western in origin and focus on “freedom”, and are limited in their analysis and scope. Some software engineers have instinctly recognized that the open-source manner-of-existence of software is advantages to software engineers and software engineering. These group of software engineers have attempted and mostly failed to frame this topic at societal level. In the meantime, proprietary corporate America has figured out various ways of bastardizing FOSS and its fruits. Some such examples include, Tivoization, Appelization and servicization. Over time FOSS/FLOSS movement have produced a complete operating system, where in the software arena, we now have a complete solution that can compete with proprietary software. But, in the meantime the arena has shifted from software to services. Various projects provide some useful partial solutions at component level. For example, the Tor software protects you by bouncing your communications around a distributed network of relays run by volunteers all around the world: it prevents somebody watching your Internet connection from learning what sites you visit, it prevents the sites you visit from learning your physical location, and it lets you access sites which are blocked. In order to combine the results of various of these freedom oriented component projects, the FreedomBox attempts to create an umbrella profile. Yet it fails to recognize that what is needed is not just the box but a full digital ecosystem. None of these attempts have recognized that the problem needs to be addressed as the complete digital ecosystem level and at societal level. Most of these attempts fundamentally come from the American and Western model of thinking and analysis. The Internet has its origins in America. In the beginning, the Internet was a healthy Engineering construct – and we played a minor role in its formation. The initial model of the Internet was rooted in the end-to-end model of interactions between autonomous entities/individuals, but things changed quickly. The Internet became a business construct. Now, the current basic model of Internet is rooted in the rise-of-the-middle model of corporations exploiting the individual. Errant American copyright and patent law sourced from the US Constitution – Ramifications of such grave ownership mistakes are complex and long lasting. But, they can be even more harmful than the previous American ownership mistake – American slavery. Unbounded Corporations. The Corporation, an entity whose sole purpose is to generate profit is permitted to do all that it pleases and in many respects is considered equivalent with human individuals. This model reduces humans to the level of Corporations – greed driven psychopathes. Uses of Internet as an instrument to exploit other societies and cultures. Based on American Exceptionalism. These dynamics are such that Proprietary American Internet model puts not just America, but the entirety of human civilization in danger. We will refer to the above American spheres of consensus that shape the core of American character as "The Proprietary American Regime" – and sometimes just "The American Regime" or “Americanism”. It is the belief system and not Americans as individuals that we are referring to – while recognizing that the core of character of most American individuals shapes the American Regime and is shaped by it. Furthermore, the belief system that we call "Americanism" physically and geographically spans far further than the United States of America. Many through out the world have been inflicted by this disease and are “Americanized”. The American Internet model is being portrayed to the world as universal. It is not. There is more to the world than the American Regime. The American Regime has produced well understood results for other crucial aspects of life that the civilized world has fully rejected. Much of the world wishes to be separate from the American Regime. Consider how Americans view prescription medications. The Anglo-American culture permits advertising of prescription drugs on Television. Nowhere else in the world is this permitted. The exclusive producer of the patented medication is permitted to dangle the cure in front of the sick – in public. The profession of medicine is by-passed by the business where the sick is encouraged to tell the doctor what to do. Consider how Americans consider university education. The average American graduate comes out $35K in debt. The purpose of education has become preparation for economic activity. In the American model, learning too has become a purely economic activity. Consider how Americans view their guns. When extreme individualism is at the center, ridiculous arguments for ridiculous freedoms become the norm. The distance from there, to “going postal”, “Columbine”, “Sandy Hook”, etc. is very little. Consider how Americans view relations with other societies. America’s short history points to exploitation, colonialism, dominance and imperialism as clear trends. The natives are now concentrated in reservations. The African continent has been destroyed and the African languages and cultures were bulldozed into oblivion. Descendants of those African slaves are now a majority in American prisons. The use of the atomic bomb, the ultimate weapon of mass destruction, was initiated by Americans. The CIA’s clandestine coups to manipulate and exploit Iranians, Arabs, South-Americans, etc. are celebrated and glamorized through the Jewish-American Hollywood. The patterns of Vietnam, Iraq and Afghanistan point to the inability of Americans to listen, understand and learn. The Japanese/Brazilian/Iranian/Chinese/French/Cuban/Indian/Russian/etc models for food, medicine, university education and guns are distinctly different from the American model. Much of the civilized world looks at the American model and sees a purely economicly oriented savage model. This of course is very different from what Americans see when they look in the mirror. This degree of self-absorption and these extremes of American monocultures of the mind are genuinely exceptional. Given these trends, should the world accept the American Regime’s model for the global Internet? Unlike, food, guns and medicine (mono-existentials) which are inherently local, the inherent digital (poly-existential) nature of Internet is global. Adoption of the purely proprietary American model of Internet puts civilization and humanity in danger. Rejection of the American proprietary model of the Internet is far more complicated than rejecting the local American models of food, medicine, guns, etc. Slogans and chants are ineffective and complete physical separation is impractical. A large segment of the planet has already come to recognize that the greatest threat to humanity is Americanism. It is wholy wrong to allow the Proprietary American Internet to become a propagation vehicle for Americanism. It should not be permitted. Our Anti-American tone here is not against Americans as individuals. American individuals who disagree with our root cause analysis, may continue their use of their proprietary American digital ecosystem. The cure that we offer below is for all of humanity and is equally applicable to American individuals who recognize the disease. Full rejection of Western IPR regime. Very important aspects of societal frameworks which have immediate impact on shape of digital ecosystems are laws and models governing poly-existentials. Societal Agreements governing all that is digital (and more broadly poly-existentials) in the West is based on the Intellectual Property (IP) regime. This has shaped the entirety of Western Digital Ecosystems. Internet Services consist of software execution accessed through a network. As such, software may no longer be in the immediate possession of the user. Internet Services are therefore a distinct part of digital ecosystems – separate from Software. The Libre-Halaal ByStar Digital Ecosystem model is fundamentally different in every respect. In terms of ownership, there is no ownership: Libre-Halaal Services in software form are a communal public resource, with no patent, copyright or secrecy barriers to free access and usage by anyone. A very important aspect of societal framework which has immediate impact on the shape of digital ecosystems are laws and models governing poly-existentials (knowledge, ideas, information, the digital entities). Societal Agreements governing all that is digital (and more broadly poly-existential) in the West is based on the IP regime. This has shaped the entirety of Western Digital Ecosystems. In contrast, ByStar is ab-initio driven by the ideology that morality and health of society should be the foundation of the ByStar digital ecosystem. The fundamental difference between ByStar ideology and the Proprietary American ideology is that in ByStar priorities, society/humanity comes first and profit/economics come second. In the Proprietary American priorities profit/economics comes first and above all else. We then focus on the halaal manner-of-existence of poly-existentials. There are things in nature that exist in singular and there are things that exist in multiples. That which exists in nature in singular, we call mono-existential. That which exists in nature in multiples, we call poly-existential. Increased importance of role of poly-existentials (knowledge, ideas, information, the digital domain) in our lives and their impact on society and humanity now requires analysis towards recognition of halaal and haraam for different forms of poly-existentials. And once we have recognized the halaal manner-of-existence of poly-existentials we need to label it. We draw a clear distinction between what Software Internet Engineering Profession means in the context of the Proprietary American Digital Ecosystem and what it means in the context of the Libre-Halaal ByStar Digital Ecosystem. In ByStar we use the term “profession” in the way it is understood in the East. The primary author of this essay, attests that: for him as an engineer it is only in Iran that he is called “Mr. Engineer Banan.” That has never happened to him in America, Canada, England, France, or anywhere else in his travels throughout the Western world. In return for all that respect, Mr. Engineer Banan owes the society something, doesn’t he? Additionally, the software engineering profession requires from software engineers that the perpetuallity of all of the above be applied to all public modifications of the software. In other words, any modification or enhancement that is generally offered as software or service forever shall also have all of the above attributes. ByStar is based on a set of key abstractions, representing the major real-world entities that must be represented within a generalized web structure. These entities include such things as individual persons, businesses, physical locations, and events. For each such entity we have defined the structures and conventions required to represent, instantiate and name that entity in a unified, consistent way, and at a very large scale. We have then defined the major classes of services required to manage these entities, and to allow highly generalized interactions within and among each other. Each BxEntity (an instance) is identified by BxEntityId. Each BxEntity can be activated within a ByStarAutonomyAssertionVirtualMachine (BxAutonomyAssertionVirtualMachine). is called a ByStarServiceObject (BxServiceObject). Currently, ByStarServiceCapability is one of the capabilities enumerated in figure 5. Each ByStarEntity consists of specific information and a set of computing and communication services. Publicly, BxEntity is usually exposed throughout Internet at a selected DNS domain name. In the ByStar model, binding of a BxEntity to one or more domain names is designed to be very flexible. This flexibility relates to Service Portability, but is broader. These notions are absent or very rare in the Proprietary American model. For instance, in the context of the examples described in Section 5, Bob Smith is assigned BxEntityId=23.1.2.7.3.32674 which is canonically bound to the base domain name 5.bob.smith.byname.net. ByStar permits Bob Smith to bind his BxEntity to other domain names, for example bobsmith.fr. In the ByStar BySMB service this is common place. Often, with the anticipation of obtaining example.com, example.bysmb.com and its BxEntity can be pre-generated. The owner, can re-adjust the binding of BxEntity to a chosen domain name at will. Different information, different capabilities and different features of a BxEntity are usually bound to different domain names within a base domain name hierarchy. For example, Bob’s imap service is at imap.5.bob.smith.byname.net, his genealogy service is at geneweb.5.bob.smith.byname.net and his synchronization repository (version control – vc) is at vc.5.bob.smith.byname.net. In cases where the owner asserts autonomy by possession of the service as a BxAutonomyAssertionVirtualMachine, ByStar provides the ability to selectively DNS resolve BxEntity domains locally. This, then also permits fully local (non-networked) development and access to BxEntity – based on existing DNS bindings. These flexible ByStar domain name to BxEntity bindings, and flexible DNS resolutions, are built on top of djbdns. When a service is associated with a unique “owner”, certain characteristics of the service are of particular concern to the owner. The service may include information of a personal or private nature, and the owner may wish to ensure that his/her/its privacy is protected. It is also important that the service reflect and maintain the autonomy of the owner, providing parallel freedom of action to that which the owning entity enjoys at large. We define an autonomous libre-halaal service as an Internet service associated with a unique owner, that the owner could in principle and at his option take control over and provide for himself. ByStar services are structured in two layers. (1) ByStar Autonomous Services and (2) ByStar Federated Services. Any ByStar Autonomous Service may also include ByStar Controlled Services. Service and Data Portability. At the instruction of the service owner, the entire service can be transferred to a different service provider. This could be another second-party provider, or the service owner himself. Any ByStar Autonomous Service may control certain “ByStar Controlled Services” that are his. A ByStar Controlled Service is a ByStarEntity which is in control of ByStarAutonomousEntity. As an example consider an individual (say the author – http://mohsen.1.banan.byname.net) who hypothetically owns a house, a bicycle, a Nike fuel band and a tag for his suitcase. A House – http://info.1-98008-5807-10.bywhere.net – where ByWhere structure links control to its owner (a ByStarAutonomousEntity). A Bicycle – whose location information goes to it owner (a ByStarAutonomousEntity) and not Google-corporation. A Nike Fuel Band – which send the exercise information to its owner-individual (not Nike-corporation). A tag for his suitcase – which links to it owner (a ByStarAutonomousEntity). Each of these as a ByStarControlledEntity will be controlled by the ByStarAutonomousEntity. All of these are ByStarEntity-s. The ones that are controlled, link to their controller. The ByStarAutonomousEntity has links to all the ByStarControlledEntity-s that it controls. So, we now have a framework for abstracting individuals as owners/controllers through ByStarAutonomousEntity. And we have abstractions for things to be owned and controlled through ByStarControlledEntity. And we have a framework for interaction of individuals/things and things/individuals through ByStar Federated Services. Now, compare the model of ownership and interactions of Things in Libre-Halaal ByStar Digital Ecosystem – which is anchored in the autonomous individual – with the Proprietary American Digital Ecosystem – which is anchored in the Proprietary Corporation. There the proprietary internet service provider controls individuals also through Things. Autonomous services and their controlled services may wish to engage in end-to-end interactions with other autonomous services. But in order to facilitate such interactions, involvement of some intermediary services may be needed. The concept of Federated Services is layered above Autonomous Services and focuses on interactions amongst Autonomous Services and facilitation of information aggregation amongst ByStar Services. Blee (ByStar Libre Emacs Environment) is a layer above Emacs and Firefox that integrates ByStar platform (Debian GNU/Linux) capabilities into Emacs and provides for integration with ByStar Services. The Libre-Halaal ByStar Digital Ecosystem is designed to fully reside in the Libre-Halaal-Convivial quadrant, . The dominant model of interaction between people and the model of access to information in the Proprietary American Digital Ecosystem is the centrally controlled Rise-of-the-Middle model – which puts the service provider at the center of all interactions so that it can exploit users and traffic information. The Libre-Halaal software model is a flourishing creative environment, generating a constant stream of new and better software packages, duplicating and surpassing the capabilities of an ever-increasing portion of proprietary software territory. Indeed for any particular item of functionality, there are typically multiple alternative free software packages available. In this environment the model for implementation of By* service functionality is not one of original software development. Rather it is a process of intelligent selection and integration of functional components from the Libre-Halaal software creative environment. By confidentiality we mean: ensuring that information is accessible only to those authorized to have access. By anonymity we mean: the characteristic of any interaction where an individual protects his or her identity from being shared with another person or with a third party in the context of particular communications. By privacy we mean: the ability of an individual or group to seclude themselves or information about themselves and thereby reveal themselves selectively. ByStar Autonomous Services are designed to provide tangible confidentiality, anonymity and privacy on large scale. All of Libre-Halaal ByStar Digital Ecosystem has this inherent design. The basic assumption in the ByStar Digital Ecosystem is that all communications and traffic is subject to eavesdropping and traffic analysis. Fortunately, the nature of digital information is such that it is easier to encrypt than it is to decrypt. With nature on our side, ByStar Digital Ecosystem provides large scale countermeasures which include end-to-end data confidentiality and traffic flow confidentiality. ByStar federated services are governed by transparency and well understood logging expectations and audit trail protections which are oriented towards preservation of privacy. All of this is in stark contrast to how confidentiality, anonymity and privacy are in the American Proprietary Digital Ecosystem. There, they have become a currency. Free Protocols Foundation is the non-profit legal entity that facilitates collaborative development, maintenance and administration of ByStar. ByStar Name and Number Assignment Authority, is responsible for central assignment of names and numbers for ByStar services. Design of ByStar as an ab initio independent separate digital ecosystem permits ByStar to expand beyond the Proprietary American Digital Ecosystem. This is desired and possible for two main reasons. First ByStar ideology may demand certain separations. Second, end-to-end purity of ByStar software-service continuum enables ByStar to do things that are not possible in the Proprietary American Digital Ecosystem. ByStar’s Public Key Infrastructure (PKI) and the possibility of a ByStar Alternative DNS Root, and ByStar Digital Currency are some examples. Thus far our focus has been in making sure that the overall architecture of the ByStar Digital Ecosystem is sound. We have been designing big and implementing gradually. A complete stable system is in place. It is now a matter of expanding and improving it. In ByStar, today for email, we don’t use gmail, yahoo, msn, outlook.com, aol or other proprietary centrally controlled mail services. We use BystarMail. Similarly, for web presence, content publication, photo and video galleries ByStar has existing capabilities. A snap shot of the organizations, services and software that form the ByStar Digital Ecosystem today are shown in Figure 7. Free Protocols Foundation central resources are shown in violet in 7. Neda resources are shown in yellow. Current ByStarEntity generators are shown under the “ByStar Autonomous” label and ByStar federated services are shown next to them. ByStar software consists of three major layers, these are shown in blue. Current capabilities of ByStarServiceObjects are enumerated in figure 5. PKCS – ByStar Public Key Infrastructure (PKI) – Credentials. A number of ByStarEntity Generators—the machinery required for fully automated creation of new service instantiations—are in place for a number of ByStarEntityTypes. Current ByStarEntity Generators are shown in Figure 7 under the “ByStar Autonomous” label. We thus have the ability to create unlimited numbers of new accounts in batch mode, or at any time we can “enable” the services, to permit self-service account creation by individual and business users. A number of sites are in place for facilitating inter-autonomous relations. Current Federated Services are shown in Figure 7 under the “ByStar Federated” label. However we are not following this standard early proof-of-service approach. This may be appropriate for a conventional new service, where service functionality is the central and most critical issue. But for ByStar, a different timing strategy is required. Instead we have provided a coherent and complete description of the model in this and our other documents. The theoretical basis for the model is solid, and this will be clear to anyone willing to invest the time to understand it. In addition a number of working By* implementations are already in place; examples are provided. Though the scale of usage remains small, these are sufficient to demonstrate the viability of the Libre-Halaal model and the ByStar design, and the value of the resulting services to paying clients. What we want to do on very large scale and in the open has been done in medium scale in private. For instance, the United State’s National Security Agency (NSA) has created a separate parallel private digital ecosystem for its own use. NSA operates the private .nsa TLD; many NSA internal email addresses are of the form username@r21.r.nsa, mirroring the NSA organizational group structure. NSA has a particular ideology for its digital ecosystem which includes a large element of security, confidentiality and secrecy. NSA through use of its own particular software and services has created a complete different environment in parallel to the internet. Precedence of such private parallel digital ecosystems combined with the proven power of Libre-Halaal software demonstrates that widespread realization of ByStar digital ecosystem is very viable. Some engineers kind of get it and have been trying to build various piecemeal privacy and autonomy software and services. Such efforts have always stayed limited in scope and scale. That is primarily for two reasons. First, because the engineers have failed to connect with society. And second, because piecemeal solutions don’t work. We build on these piecemeal privacy and autonomy software and services and bring them into ByStar as integrated and complete large scale services. An example of a piecemeal privacy effort is PGP - Pretty Good Privacy. A bunch of engineers and technologists use it amongst themselves but PGP never penetrated the society at large. ByStar comes with Public Key Infrastructure (PKI) as an integral part of the service and equivalent of PGP is an inherent part of ByStar. Another example of a piecemeal privacy effort is Tor https://www.torproject.org. Tor attempts to accomplish traffic flow confidentiality just through redirection. Traffic flow confidentiality is an inherent part of ByStar which includes redirection and layer 3 and layer 7 padding as well. The existing capitalist model for mono-existentials is generally correct, in both philosophical and economic terms. But the extension of the mono-existential capitalist model into the domain of poly-existentials, based on the Western IPR regime, is a grave mistake. Philosophically it is wrong. Societally it is harmful to humanity. And economically it is unstable and vulnerable, since it can be displaced by disruptive business models like ours. The ByStar Open Business Plan explains how this will come about, and how we will profit from this. As shown in Figure 8, the By* services are positioned in the For-Profit Non-Proprietary Quadrant For Internet Services. 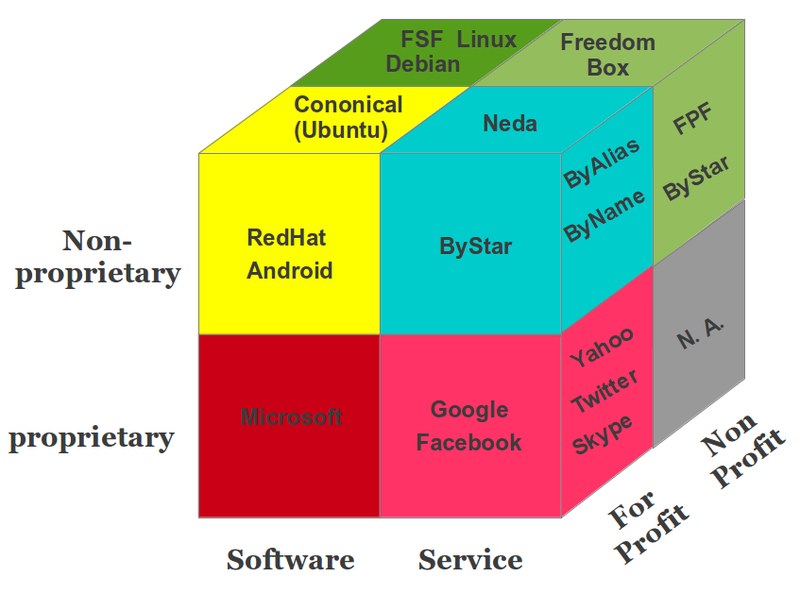 As shown in Figure 8, the By* services are positioned in the For-Profit Non-Proprietary Quadrant For Internet Services. Note that in the non-proprietary layer, re-use and collaboration is far richer than the proprietary layer. For example, in the Software slice, Debian and Ubuntu cross progress. In the Services slice the same can happen. Where for example ByStar and FreedomBox can cross progress. The Libre-Haraam software model, operating under Western copyright restrictions, includes a highly effective recurring revenue generation model: the proprietary software licensing model. But the Halaal manner of existence of software eliminates all restrictions on the distribution and use of software. Thus the Proprietary-Haraam recurring revenue model is also largely eliminated. Recurring revenues under the Libre-Halaal software model are much less than under the Haraam software model. The Halaal manner of existence of software creates a powerful generative development model for Libre-Halaal Internet Services. This generative model is absent from Proprietary-Haraam Internet Services. Thus Libre-Halaal Internet Services have a major advantage and can compete directly with Proprietary-Haraam Internet Services in terms of development. The basic recurring revenue models for Libre-Halaal Internet Service providers are essentially the same as for Proprietary-Haraam Internet Service providers. Thus in terms of revenue generation, Libre-Halaal and Proprietary-Haraam services are on an equal footing. In Figure 9, we illustrate the ByStar value chain on the left column and its inter-mixing with proprietary value chains on the right column. Focusing on the right column of Figure 9, notice that “Neda Operated By* Services” establish a direct relationship with Subscribers and Users at the very top. Note that the scope of these Internet services is everything – the * in By* – and that the intended scale of these services is planet-wide. By definition, no Internet services opportunity can be bigger than that. The arrows between Neda Services and User/Subscriber in Figure 9 include an element of “Trust, Loyalty, and Respect” which is the result of “ByStar Ideology” that we presented earlier. The element of trust and respect is fully absent in the left column. In business terms, Trust and Respect, translate into “stickiness” – where the user is more committed to the service. So, you see, all our investments in ideology are actually also business wise. All of the ByStar value chain software is Libre-Halaal (Free and Open Source) software. ByStar software in Figure 9 is shown in two different colors. 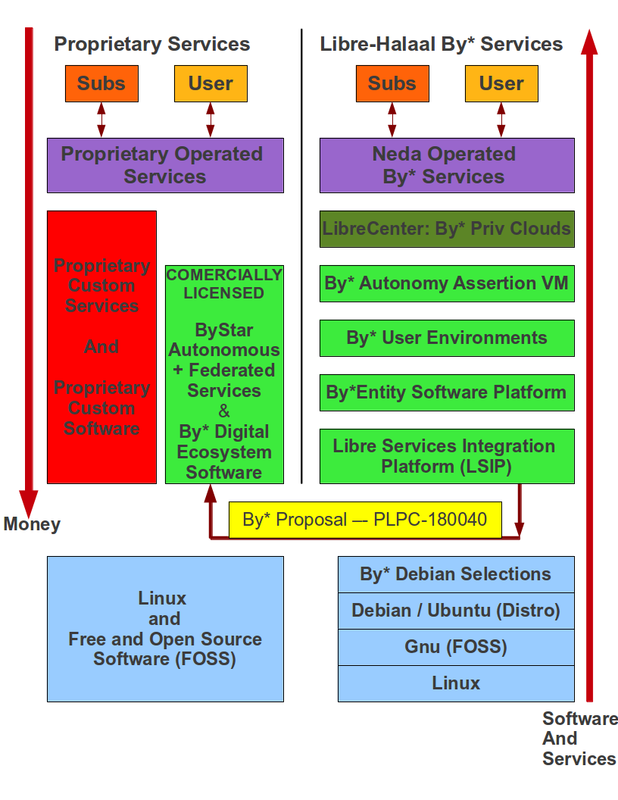 In the left column of Figure 9, we illustrate a typical proprietary ASP who is incorporating ByStar as part of its services based on the Neda Commercial License. 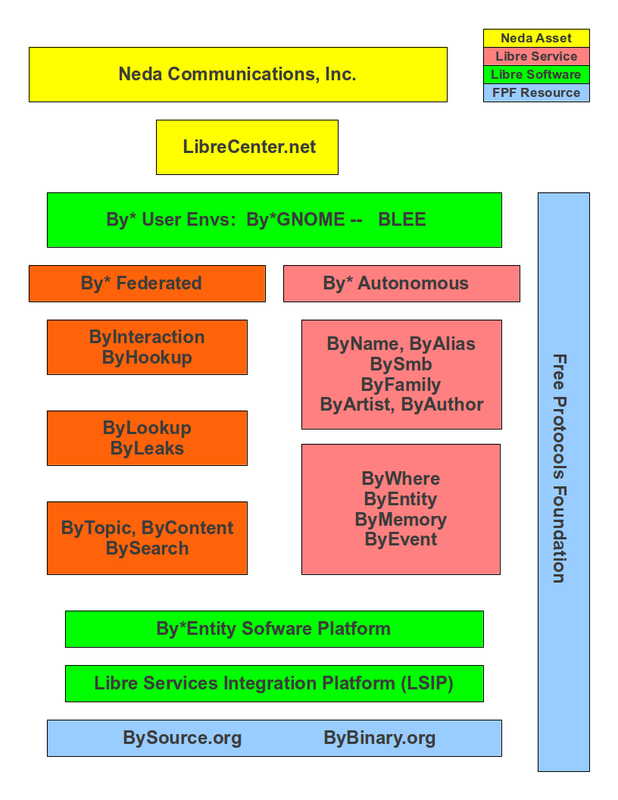 Design of LSIP and the ByStarEntity Software Platform recognize the evolution of underlying external software (bright blue) in the ByStar value chain.bywhere This is the extraordinary magic of Libre-Halaal software and services: the ability to take things and reuse them at extremely low cost. This is the fundamental growth dynamic of Libre Services, and the powerful generative force that is lacking in the proprietary model. This is the key dynamic that causes the By* Libre Services eventually to surpass the proprietary model entirely in terms of features and functionality. In ByStar Publications List – http://www.by-star.net/bxPublications – we provide pointers to ByStar related articles. These documents evolve as ByStar evolves, and the publications list will be kept up-to-date. The ByStar publications list is structured primarily for reference. Below we provide a description of how these documents collectively draw a comprehensive picture. The big ByStar picture is shown in Figure 10. Each of the layers in this figure represents either a conceptual definition (shown in blue), or an actual software/service implementation (shown in orange). Each layer builds on the layers beneath. Figure 11 shows how the moral, legal, societal, engineering, economic and business dimensions of the ByStar Halaal Digital Ecosystem are layered as described above. The gigantic picture we have drawn in Figure 11 is a blueprint. It represents a complete framework for collaborative work towards an alternative to the current proprietary digital ecosystem. By aligning ourselves with the natural forces and dynamics of poly-existentials, and by means of large-scale unrestricted collaboration, we can achieve this. Let’s explore ByStar in the context of a few examples. All these examples are completely fictional. Let’s consider Bob Smith, a 46 year old university researcher and his 15 year old daughter, Alice Smith. Alice is a freshman (9th grader) at Garfield High School (GHS). Bob wishes to have the following in ByStar. An Autonomous ByName BxEntity for his private and public use – 5.bob.smith.byname.net (he is the 5th bob.smith requesting byname services). An Autonomous ByFamily BxEntity for his family – 8.smith.byfamily.net. A Controlled ByFamily BxEntity for his daughter Alice – alice.8.smith.byfamily.net (Alice is a minor and Bob wishes to have the option of overseeing her communications). A Controlled ByWhere BxEntity for their condo in Kirkland, WA – 1-98034-3681-74.bywhere.net (say for reliable driving directions). There are 3 different realization models for Autonomous BxEntity-s.
Bob is concerned about privacy and prefers the “Hosted Private Cloud Autonomous Model” over the “Shared Cloud Autonomous Model”. He trusts the ByStar model enough not to need the “Premise Private Cloud Autonomous Model”. In the following sections we describe ByStarEntity realization models in the context of Bob and Alice’s example. As we go through these examples, we will also be comparing them with their counter part in the Proprietary American Digital Ecosystem. Through ByStar, Bob needs to have an Autonomous ByName Registration, an Autonomous ByFamily Registration and a Controlled ByWhere Registration. for a ByWhere controlled entity. All of the above were external registrations. In the ByStar model, Bob himself has now become a registrar for some ByStarEntitys. Note that Bob has the option of using a single password and that all his ByStarEntityId are related. With his 5 ByStarEntityIds in place, Bob now can realize his ByStarEntitys in the model that he wishes. This model is very similar to how Gmail and other proprietary Internet services works. It involves Bob going to http://www.byname.net, logging in and using the web service. Even at this level, there is a big difference between the Proprietary American Services and the Libre-Halaal ByStar Services. ByStar is transparent – not opaque/dark/closed. Even in the shared cloud autonomous model, Bob has the choice of demanding that his entire service be delivered to him as a ByStarAutonomyAssertionVirtualMachine – that means the entire software for the ByStar service and his entire data be delivered to him. And that the service provider abide by the “Service Data Portability” and “Service and Data Non-Retention” obligations. In the Gmail (and other) Proprietary American Model there are no such concepts. Bob downloads to his laptop the latest generic ByStarAutonomyAssertionVirtualMachine. This has all the relevant software for ByStar services. The latest generic ByStarAutonomyAssertionVirtualMachine is available at http://www.bybinary.org. Bob then adds his ByStarEntitys to the ByStarAutonomyAssertionVirtualMachine. This involves Bob running the ByStarAutonomyAssertionVirtualMachine on his laptop and entering his ByStarEntityIds into the ByStarAutonomyAssertionVirtualMachine. All of Bob’s ByStar services are now added to his ByStarAutonomyAssertionVirtualMachine. Bob then chooses a host for his Virtual Machine. His choice of ByStar Private Cloud Provider may be influenced by the location and laws of where the ByStar Private Cloud Provider operates in. If U.S. wiretap laws are too invasive to his taste, he may choose a ByStar Private Cloud Provider outside of the U.S. – ByStar is very global. Let’s say that Bob chose http://www.librecenter.net. Bob then transfers his fully configured ByStarAutonomyAssertionVirtualMachine to http://www.librecenter.net and runs the service. Bob is now in control of his own service. ByStar and LibreCenter have given Bob what is necessary and are supporting him. Bob is in possession of all of the service’s software and the service is Bob’s. In the Premise Private Cloud Autonomous Model, Bob is in possession and control of the entire software and the entire hardware for the service. A Premise ByStar Host is a computer with a static public IP address capable of running a ByStarAutonomyAssertionVirtualMachine. Any modern desktop or laptop would do just fine. Bob does what was previously described in Section 5.3.1 and Section 5.3.2 to prepare his ByStarAutonomyAssertionVirtualMachine. A typical ByStarAutonomyAssertionVirtualMachine is capable of containing 100s of ByStarEntitys. Bob then puts his ByStarAutonomyAssertionVirtualMachine on his “Premise ByStar Host” and runs it. Bob now possesses all of the software for ByStar. Bob now possesses all of his own data. Bob now possesses all of his logs and audit trails. Bob now controls all of his services. This means real and tangible autonomy. Efforts like FreedomBox have been attempting to accomplish this in a more limited fashion. But in the ByStar model the Premise Private Cloud Autonomous Model is just one of many ways to realize tangible autonomy. So, now Bob and Alice have a number of autonomous services in place. Now, let’s see how they will be accessing them and what these ByStar Autonomous Services can do for Bob and Alice. Most ByStar services are also offered as interactive web services just like traditional web services. The generic ByStarAutonomyAssertionVirtualMachine includes all ByStar user environments. A Tor-Firefox browser is all you need for ByStar interactive web services. But the prefered model for accessing ByStar services is through Blee. Use of Blee makes for a very rich software-service continuum model that does not have a real counter-part in the Proprietary American Digital Ecosystem. With everything in place, let’s see what are some of their ByStar capabilities. ByStar full set of Autonomous capabilities is determined by the capabilities of Bob’s ByStarAutonomyAssertionVirtualMachine. These are already quite powerful and they are ever growing. Below we mention some. In terms of email capabilities, ByStar email is similar to Gmail. However, ByStar email is very autonomous, very personal and very private. For example, note that email communications between Bob and Alice need not even leave Bob’s ByStarAutonomyAssertionVirtualMachine. Beyond Gmail like capabilities, ByStar email service is inherently multi-address and multi-mailbox. Libre-Halaal ByStar email services are superior to Proprietary-Haraam email services both in capability and privacy. ByStar public and private web presence services are very rich. They are based on the Plone Content Management System. The URL for Bob’s public web site would be http://5.bob.smith.byname.net. Its capabilities could be similar to the author of this document’s site: http://mohsen.1.banan.byname.net. Bob and Alice and their family’s (8.smith.byfamily.net) photo gallery can be similar to what is in: http://mohsen.1.banan.byname.net/albums. ByStar Photo and Video Galleries are based on galleria and are integrated into Plone. ByStar photo gallery capabilities comfortably compete with the likes of flickr and photo bucket. The difference of course is that Bob and Alice remain in control of their photos with ByStar. Bob and Alice can build their genealogy tree in ways similar to what is in: http://mohsen.1.banan.byname.net/genealogy. ByStar Genealogy Services are based on geneweb. ByStar genealogy capabilities comfortably compete with the likes of ancestry.com, FamilySearch, and MyTrees.com. The difference of course is that with ByStar, Bob and Alice remain in control of their genealogy personal information. Bob Smith is an academic. He writes and publishes a lot. Some of his thoughts and writings are outside of the mainstream. As a true academic, he prefers not to subject his publications to restrictions that the likes of IEEE and ACM demand. His publication philosophy is consistent with ByStar Publication Philosophy. He uses the ByStar Content Production and Content Publication Facilities to write and publish. The access page to Bob’s documents are similar to this document’s: http://mohsen.1.banan.byname.net/PLPC/180016. Bob, can optionally use ByStar Federated Services to achieve permanence and ease of search and access to his writings. See Section 5.7 for more details. So, ByStar has empowered Bob to be a true academic and avoid pseudo academic copyright-ed publication traditions. Bob has chosen to subject some of his publications to “Federated Re-Publication”. He uses http://www.bycontent.net for that. ByContent is a ByStar Federated Service where ByStar self-published documents are republished. By submitting some of his documents and podcasts (videos) for ByContent re-publication, Bob accomplishes several things. Permanence. If Bob’s web site or he, himself disappear, his documents still remain. Large volume publication. ByContent runs on large computers with access to lots of bandwidth. Bob need not worry about slowness of access to his public videos and public writings. ByContent republication maintains reference to original source. Classification with peer content. Bob’s content is classified and sits next to other similar and competing content. ByContent is similar to YouTube. Except that ByContent allows your content to be clearly refered back to you. 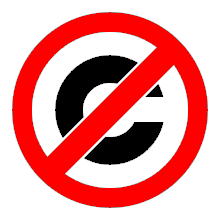 All of ByContent is copyleft. Now, Let’s look at this example in its entirety and see what Bob and Alice gained by buying into the ByStar Digital Ecosystem. First, they lost nothing. ByStar exists in parallel to the proprietary Internet. Everything that everybody else can do, Bob and Alice can do as well. Through peer pressure Alice will likely be pushed to join Facebook. But, Bob and Alice now have autonomous and private email. They communicate with everybody else in normal email fashion. But they are in control of their personal messages. When Bob deletes an email he knows that the email has truly been deleted. And Bob and Alice are truly in control of what they do with their photos, and their content on the Internet. That can be considered a good begining. ByStar is evolutionary. ByStar is designed to be ever-growing and comprehensive. Are you ready to follow Bob and Alice’s example? Though it is not part of popular cultural awareness, there is currently a titanic battle taking place between two competing ideologies: the proprietary software model (exemplified by Windows), and the libre-halaal software model (exemplified by GNU/Linux). This is a to-the-death battle, from which there can eventually emerge only a single winner. The software battle is part of a broader ideological contest, about ownership models for poly-existentials in general (software, but also including literature, music, images, movies, etc.) in the digital era. This ideological war is rooted in the manner-of-existence of digital entities as this has broader ramifications for individuals and society – which impact autonomy, privacy, freedom, and social interaction. The inherent nature of software, Internet services and other poly-existentials is fundamentally at odds with these historical conventions of physical property (mono-existentials) ownership. Such constructs have the inherent potential for unlimited replicability and dissemination, and in the age of the Internet this potential is now fully realized. In practice, the proprietary software and services model has engaged in various forms of bastardization of libre-halaal software model. Well recognized examples of such bastardizations include the service loophole, Tivoization, Appleization, and Androidization. In practice, open-source and free software movements represent compromising models and ideologies. For the most part they are comfortable being intertwined with the proprietary model. Full rejection of the proprietary model is considered radical in much of the open-source culture. In practice, with ByStar ideology we accomplish three things. First, we create a completely separate and independent digital ecosystem that fully rejects the proprietary model. Second, we take all possible measures to prevent bastardization of ByStar software and services by the proprietary model. Third, we create a comprehensive internet services business model which competes directly with the proprietary model in terms of revenue and profit. Please refer to http://www.by-star.net/bxPublications for a list of publications that we have felt is necessary for ByStar to be equipped with. We have analyzed the forces in nature that work against the existing Proprietary American Digital Ecosystem – and those which are in harmony with the Libre-Halaal ByStar Digital Ecosystem – and have identified a number of “tear points”. Our execution is focused on these tear points. For ByStar to become truly widespread – a major realty at societal level – ByStar ideology needs to resonate with societal values. As such, on large scale, ByStar will likely be adopted in different societies to different extents. While America leads Internet technology today, full adoption of ByStar based on ByStar ideology will likely be difficult in America. Simply put, it is naive to imagine that there is any hope that Libre-Halaal Software (or any form of non-proprietary software) can become basis for formulation of national policies in any Western society. In the West there is track record for where Libre-Halaal software and Internet services fit in Western societies. The advantages of being in harmony with nature has not been sufficient to bring GNU/Linux to the center – other than through economically driven bastardizations of Libre-Halaal software such as Appleization, Tivoization, Androidization, etc. Some Westerners are now starting to see some problems with their current software and Internet services model. Autonomy, privacy and liberty are being crushed. ByStar is the cure for those Westerners who value autonomy and liberty and who recognize the current ills and trends. We offer the Libre-Halaal ByStar Digital Ecosystem and ByStar ideology to Americans the very same way that it is being offered to all societies – there to be understood and taken. Libre-Halaal software and Libre-Halaal Internet services have a much better chance of becoming a basis for formulation of national policies in Eastern societies. Libre-Halaal ByStar Digital Ecosystem thrives when Western IPR is rejected. The full beauty and power of ByStar will not be realized, until a culture whose ideology resonates with ByStar ideology, is ready to fully adopt ByStar. Today if you want to write in Persian or in Arabic, your main choice is Microsoft’s Proprietary-Haraam Windows environment. And in the business driven Western model, Perso-Arabic users are always second class citizens because they represent an insignificant market to the likes of American Microsoft and American Google. In other words computing and communication capabilities of Perso-Arabic societies is determined by Americans. Eastern societies recognize this and see how Libre-Halaal Software can provide an alternative. The libre-halaal model creates an entirely new environment in terms of competition, collaboration, and value chain relationships. Libre-Halaal software and Internet Services are genuine public resources, not owned by anyone, freely available for reuse by anyone. They are created by society/humanity, for society/humanity. By* can only be significant if its usage is widespread and if By* collaborative development involves many. We have created many venues to facilitate collaboration. And now we ask you, to assist us in making the Libre-Halaal ByStar Digital Ecosystem widespread. As engineers, our focus has been manner-of-existence of software. Artists, filmmakers, writers, musicians and software developers who recognize by eliminating restrictions on the content that they produce, we are all better off. ByStar offers much Libre-Halaal software to content producers who understand that the correct manner-of-existence of all content is Libre-Halaal.
" Mohsen BANAN ". " the bystar applied model of federations of autonomous libre-halaal services ". Permanent Libre Published Content "180015", Autonomously Self-Published, "August" 2011. http://www.by-star.net/PLPC/180015.
" Mohsen BANAN ". " the libre-halaal bystar digital ecosystem a unified and non-proprietary model for autonomous internet services a moral alterantive to the proprietary american digital ecosystem ". Permanent Libre Published Content "180016", Autonomously Self-Published, "September" 2013. http://www.by-star.net/PLPC/180016.
" Mohsen BANAN ". " the nature of poly-existentials: Basis for abolishment of the western intellectual property rights regime ". Permanent Libre Published Content "120033", Autonomously Self-Published, "September" 2013. http://mohsen.1.banan.byname.net/PLPC/120033. Inc. " " Neda Communications. " a strategy for rapidly becoming an internet application service provider joining, adopting and/or licensing bystar a public unsolicited proposal ". Permanent Libre Published Content "180040", Autonomously Self-Published, "August" 2013. http://www.by-star.net/PLPC/180040. Inc. " " Neda Communications. " bystar web facilities bystar content production, publication, and distribution services ". Permanent Libre Published Content "180038", Autonomously Self-Published, "May" 2013. http://www.by-star.net/PLPC/180038. Inc. " " Neda Communications. " the libre-halaal bystar digital ecosystem an inversion to proprietary internet services model neda communication inc.’s open business plan ". Permanent Libre Published Content "180014", Autonomously Self-Published, "August" 2013. http://www.neda.com/strategicVision/businessPlan.